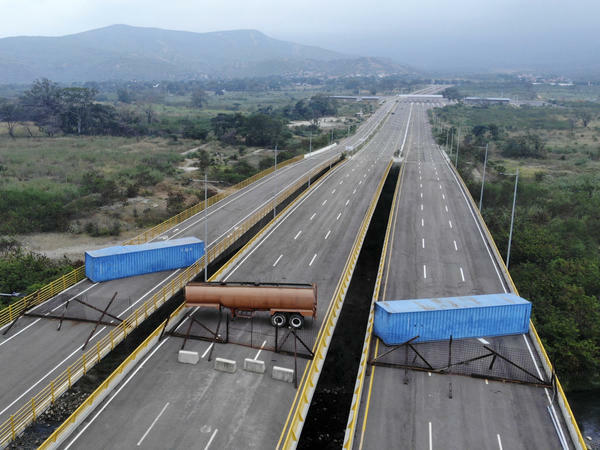 The Tienditas bridge connecting Colombia and Venezuela has been blocked by Venezuelan military forces, as seen here on Wednesday. Opposition leader Juan Guaidó and U.S. Secretary of State Mike Pompeo are demanding that humanitarian aid be allowed to enter. Updated on Feb. 13 at 10:45 a.m. The aid convoy arrived at the Colombian border city of Cúcuta, The Associated Press reports, but Maduro and the military have blocked the Tienditas bridge so that the trucks cannot enter Venezuela. "The United States is prepositioning relief items — including food, nutritional supplements, hygiene kits and medical supplies — in Colombia so they are available to reach those most in need in Venezuela as soon as possible," a U.S. official told The AP. Maduro has rejected aid offers and says his country has "never been, nor are we, a country of beggars," the BBC reports. It's not clear that the Tienditas Bridge has ever been open. Diario La Opinión, a publication based in Cúcuta, wrote in 2016 that the money spent to build the bridge has not paid off, because "the government of Venezuela insists on closing the border." A photo on Google Maps from June 2017 shows fencing and concrete blocks on the bridge. Venezuela has been in a political crisis since Guaidó, the president of the National Assembly, declared himself interim president last month. Maduro has refused to step aside and accuses the U.S. and others of attempting to overthrow him. Venezuela's economy and medical system have collapsed in recent years, sending millions fleeing from the once-rich country, home to the world's largest oil reserves. 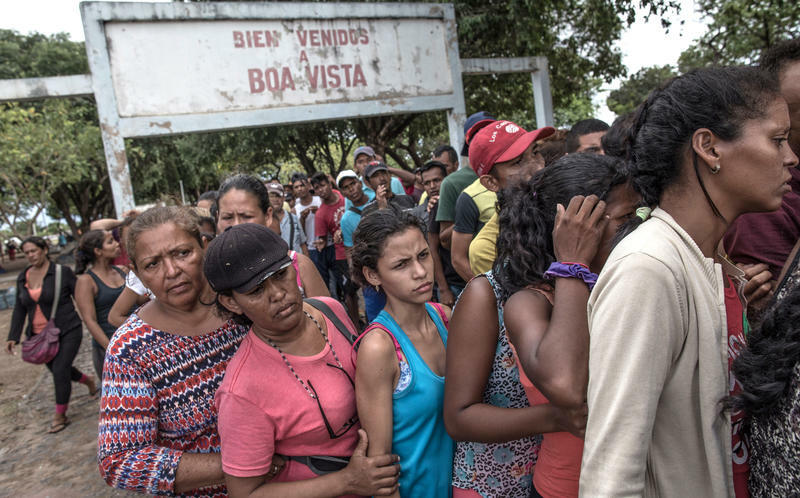 Meanwhile, Colombia's migration office has canceled more than 300 daily entrance passes used by Venezuelan politicians and the families of Maduro supporters. "It doesn't make sense that while [the Venezuelan people] migrate for hunger and need, supporters of the dictatorship enjoy these benefits and enter our country, using this card, to shop, among other things," Christian Krüger Sarmiento, the director general of the migration agency, said in a statement. U.S. Secretary of State Mike Pompeo tweeted a photo of the barricaded bridge. "The Venezuelan people desperately need humanitarian aid. The U.S. & other countries are trying to help, but Venezuela's military under Maduro's orders is blocking aid with trucks and shipping tankers. The Maduro regime must LET THE AID REACH THE STARVING PEOPLE." Guaidó has been talking about the aid convoys. "While we work every day to successfully achieve the delivery of the humanitarian aid; they insist on taking away the medicines and foods of those who need them urgently," he tweeted. Ya está llegando al centro de acopio en Cúcuta el primer avance de la #AyudaHumanitaria para atender a los venezolanos más vulnerables. "The first phase continues with collection centers in three allied countries," he wrote, posting photos of the trucks. Maduro has called the convoys "a political show," according to Reuters. Venezuelans in South Florida woke up on Saturday to the first crack in the Venezuelan military’s loyalty to President Nicolás Maduro. It was a video of Air Force General Francisco Yanez renouncing Maduro – the authoritarian leader widely condemned for trashing their homeland’s economy and democracy. Yanez insisted that “90 percent of the armed forces oppose Maduro,” and he called on other high-ranking officers to recognize National Assembly leader Juan Guaidó as Venezuela’s legitimate president – as the U.S. and many other countries have. Venezuela's once impressive medical system has crumbled dramatically. But it's hard to know exactly how bad things are — because the Ministry of Health stopped releasing national health data. "There has been a strict secrecy policy in public institutions in Venezuela ... since 2012," says Jenny García, a demographer from Venezuela now living in Paris. The government hasn't wanted to release health statistics that are simply going to make it look bad, García says. A growing number of European nations publicly backed Venezuelan opposition leader Juan Guaidó as his country's interim president, ratcheting up diplomatic pressure on President Nicolás Maduro to step down from power. 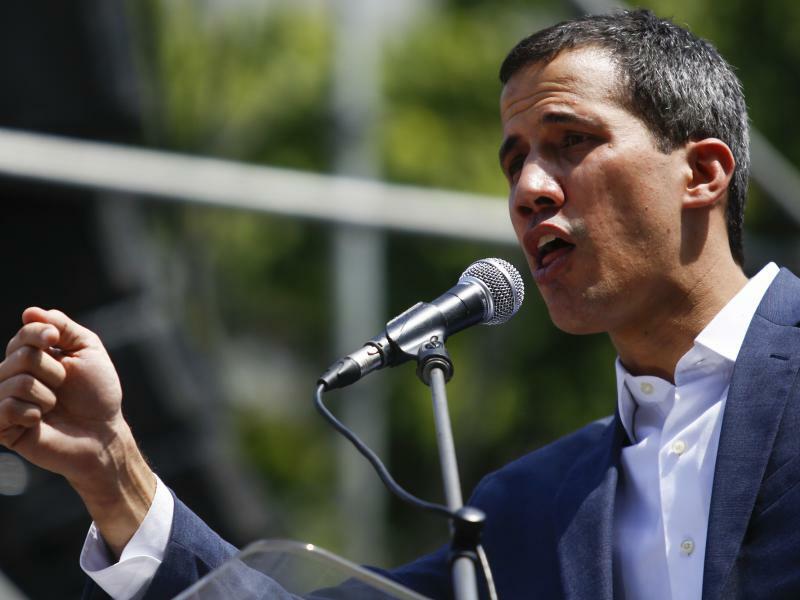 Spain, Britain, France and Germany recognized Guaidó Monday after Maduro failed to comply with their demands that new presidential elections be held in the oil-rich South American country to forestall a violent end to the conflict over who should govern Venezuela. Over the weekend the New York Times created hemispheric buzz. It reported that U.S. officials talked privately this past year with rebellious Venezuelan military officers. Those officers wanted U.S. help to overthrow Venezuela’s socialist president, Nicolás Maduro. Apparently nothing came of the talks; the Trump Administration declined to help the rogue militares. But the Times story was more evidence that President Trump is exploring unusually strong action to topple Maduro. At the White House last summer, he'd already displayed that impulse. A key group of European Union countries endorsed Venezuelan opposition leader Juan Guaido as the country's interim president on Monday, piling the pressure on embattled President Nicolas Maduro to resign and let the country hold a new presidential election. Maduro, for his part, stood defiant and accused the United States of preparing a coup in the South American country. He also said he is trying to recruit the pope's support for the opening of talks on Venezuela's future.